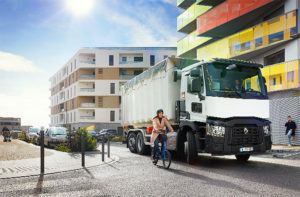 Renault Trucks is offering a suite of new technology designed to enable construction vehicles to integrate better in the city or on-site. The measures are part of the brand’s continuous focus on improving the safety of city-dwellers, drivers and their loads. Available across Renault’s C and K ranges, the new features will work alongside existing safety systems to further improve safety for vulnerable road users, such as cyclists. The new measures include an emergency parking brake application with anti-runaway mode, the addition of a passenger-side vision door that gives drivers greater sight of other road users, surveillance cameras linked to the vehicle’s main Roadpad+ screen and external presence detectors.